One of the coolest things about being a book blogger is the awesome community - especially all the fab UK bloggers around. I was about to write a list of brilliant bloggers I met last week at Faber and OUP events (okay, ANOTHER really cool thing is meeting authors - Jeff Norton! Nikki Sheehan! Joss Stirling! NATASHA FARRANT!!!) but I have a horrible feeling I'll leave someone out and feel hugely guilty about it, so I won't. Anyway, as I was saying, the book blogging community is amazing. And updating my spreadsheet of YA contemporary releases means I'm paying even more attention than normal to all of the fabulous reviews out there from British book bloggers. The only tiny, tiny downside, is that I end up reading so much about some books that a) I have an idea what to expect from most things I read and b) sometimes really hyped books that everyone else likes feel like a letdown if I'm not so keen. 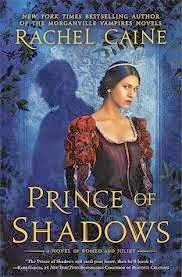 A few days ago I bought Rachel Caine's Prince of Shadows, a Romeo and Juiet retelling from the point of view of master thief Benvolio. It's an intriguing read with a brilliant narrator, some great supporting characters - Mercutio and Rosaline being the best - and it's really cleverly tied into the original play. As good as that was, though, it wasn't a massive surprise as I've always enjoyed Caine's writing before (although I'm miles behind on Morganville!) I don't think anything beats the feeling of randomly discovering a brilliant book by an author I hadn't even heard of previously, but that happened to me as well! The weekend before last, I visited the utterly gorgeous Tales on Moon Lane - more about this fabulous shop on Saturday - and picked up a recent release that had passed me by previously, Romily Bernard's Find Me. When sending those tweets, I hadn't realised that as well as being a brilliant author, Romily Bernard is also an incredibly generous person. She got in touch with me to discuss the possibility of a giveaway. I was thrilled when she suggested it and even more thrilled when she said that yes, she did know that I and most of my readers were in the UK and she was prepared to send books over here - how AMAZING is that? So, we ran one giveaway via the Bookbag yesterday - good luck to everyone who entered that; I'm eagerly waiting to see who wins! Another will be given away on the brilliant Snuggling on the Sofa blog. And to try and get your hands on the third, UK readers just need to RT the tweet embedded below before 11:59pm GMT on Thursday 6th June! 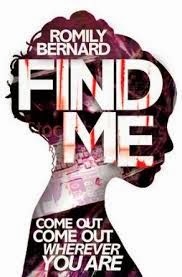 Find Me by @RomilyBernard is fab - & she's given me a SIGNED copy for a UK #giveaway! Follow me & RT before 11:59pm Thurs 6th Feb to enter. Have you read either of these books yet? What's the last book you read without knowing anything about it which turned out to be fabulous? I'd love to know, via the comments or Twitter!